Il Checkpoint Charlie era un valico di frontiera berlinese. In funzione dal 1945 al 1990, collegava il settore di occupazione sovietico (quartiere di Mitte) con quello americano (quartiere di Kreuzberg). Era situato sulla Friedrichstraße, all'altezza dell'incrocio con Zimmerstraße. Era utilizzato solo da militari, diplomatici e cittadini stranieri in visita a Berlino. Dopo la riunificazione il punto di controllo venne abbattuto e, tranne il museo del Muro, non rimaneva alcuna traccia della sua esistenza. Il 13 agosto 2000 ne venne inaugurata una ricostruzione fedele, divenuta in breve tempo di grande richiamo turistico. Presso il Checkpoint Charlie ebbero alcune fughe molto spettacolari dalla DDR. Nei pressi, il 17 agosto 1962, fu colpito e lasciato morire dissanguato il diciottenne Peter Fechter, nel suo tentativo di fuga da Berlino Est. Checkpoint Charlie was the name given by the Western Allies to a crossing point between East Berlin and West Berlin during the Cold War. Other Allied checkpoints on the Autobahn to the West were Checkpoint Alpha at Helmstedt and Checkpoint Bravo at Dreilinden, southeast of Wannsee, named from the North Atlantic Treaty Organization's phonetic alphabet. Many other sector crossing points existed in Berlin. Some of these were designated for residents of West Berlin and West German citizens. Checkpoint Charlie was designated as the single crossing point (by foot or by car) for foreigners and members of the Allied forces. (Members of the Allied forces were not allowed to use the other sector crossing point designated for use by foreigners, the Friedrichstraße railway station.) Checkpoint Charlie was located at the junction of Friedrichstraße with Zimmerstraße and Mauerstraße (which coincidentally means 'Wall Street') in the Friedrichstadt neighborhood, which was divided by the Berlin Wall. The Soviets simply called it the Friedrichstraße Crossing Point . The East Germans officially referred to Checkpoint Charlie as the Grenzübergangsstelle ("Border Crossing Point") Friedrich-/Zimmerstraße. 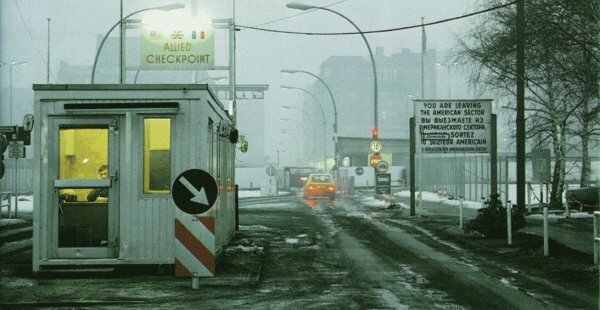 Checkpoint Charlie became a symbol of the Cold War, representing the separation of east and west, and — for some East Germans — a gateway to freedom. It is frequently featured in spy movies and books, such as those by John le Carré. The famous cafe and viewing point for Allied officials, Armed Forces and visitors alike, Cafe Adler ("Cafe Eagle") is situated right on the checkpoint. It was an excellent viewing point to look into East Berlin, whilst having something to eat and drink. The checkpoint was curiously asymmetrical. During its 27-year active life, the infrastructure on the Eastern side was expanded to include not only the wall, watchtower and zig-zag barriers, but a multi-lane shed where cars and their occupants were checked. However the American authorities, perhaps not wanting to concede that the division of Germany might be anything other than a temporary aberration, never erected any permanent buildings, and made do with the iconic wooden shed, which was replaced in the 1980s by a larger metal structure now on display at the Allied Museum in western Berlin. In the years after reunification, a reproduction of the 1960s-era wooden shed was placed at the site of the original. che qualcuno sia punito per i crimini dei suoi padri?